If you can easily find the unfollowed twitter users and increase your follow request number. 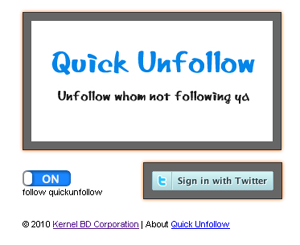 Just login twitter through quickunfollow application and get list of unfollowed members. You can unfollow them individually or you can bulk unfollow them with the selected list. You can find many websites are doing that, but what is the difference? The key difference is that “There are no fee”. You can use this application as many times as you want. We are working on this project in free time. So, if you need more features, let us know here. Then we will add your requested features with this tool. Quickbooks API Integration is a mess? Create Dynamic Category Listing for Your Ebay Store – Free!